Fits perfect, keeps accurate time, large numbers ( can’t see small ones so great feature ) watch says for man but I ordered it for me as reading reviews said band was a bit small... it will still fit a man as I have it in next to smallest hole. I Love it! 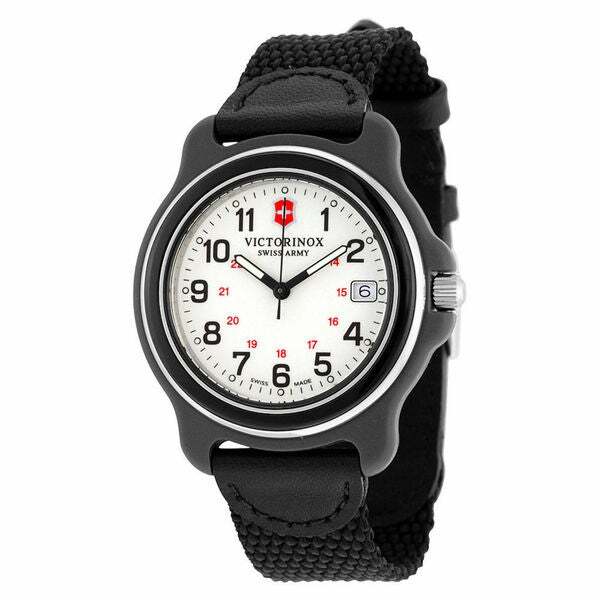 The Original collection was Victorinox Swiss Army's first timepiece design, established in 1989, and it is just as precise and stylish now as it was then. Sport a classic style at all times by wearing this watch for both work and play. The white face attractively contrasts the black case and strap for a memorable overall appearance. My husband wears it every day. It was bought as a replacement for one I got him before we were married and it is exactly the same, the design is classic. He doesn't have to take it off to shower or swim. I love every part of my new watch. Haven't taken it off since I bought it. The size is perfect and it's easy to read. I can even read the date which is every handy. I usually by leather bands but I am enjoying the band on this watch even more than the leather. It seems to be well made. I do a lot of construction and I do not even hesitate to wear this watch. I'm extremely happy with my purchase of the Swiss Army wrist watch. The service I received from overstock.com was Superior to none, everything went very smoothly. I bought this watch for my 25 year old son for his Birthday. He LOVES it. He has a yard business and can be quite rough on things at times, this watch is tough , doesn't scratch and keeps perfect time. You will not be disappointed. It's also very easy to read, set time etc. It came very quick in the post and wrapped Beautifully. Great watch, accurate time, rugged casual look, highly recommend.Bought this watch for my sons 30th birthday, he absolutely loves it. Lighted numerals a bonus.Going to buy one for my grandson next. The watch came in a cheap looking/feeling box. Watch case is plastic/resin which accentuates the cheap feel. Same with the cheap band. The numbers are just painted and hard to see in the dark. This watch just exudes low quality. I tried hard to like this watch, but just can't, knowing there are better watches out there for the same price. Good watch. Easy to read dial, fits well on wrist,classic design. Watch band has a delicate-looking metal clasp, but so far it has performed nicely and without incident. Very happy with purchase. My son loves the watch and wears it on vacation and when he's dressed for work. Looks great and comfortable. Watch is as advertised. Simple to set time and date. What I like is that it doesn't scream watch. Perfect for guys with smaller wrists. Nice, a bit small, but I have a small wrist. Fits great under shirt sleeves ! I like this watch and style. I have worn this product for a number of years and recently lost it. I wanted to replace a product I have really enjoyed.